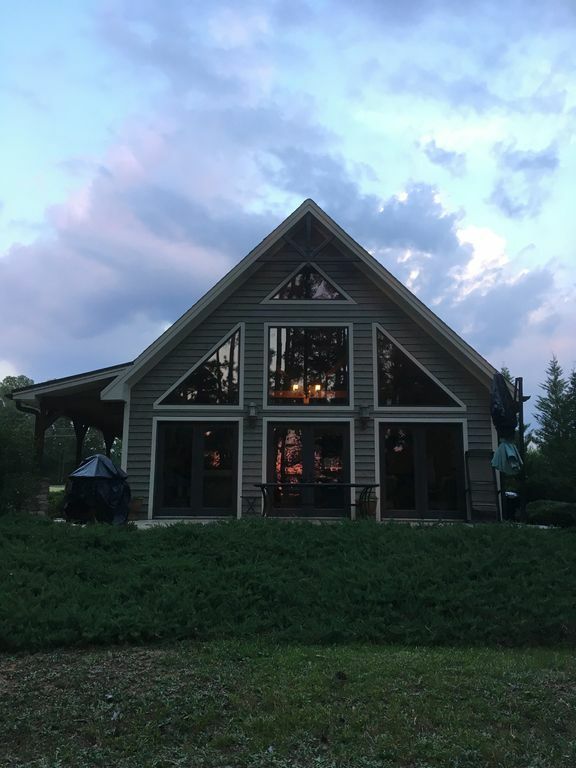 Treat yourself to our Beautiful cottage on Lake Hartwell. Take in the views of the lake from our 2 story wall of windows that overlook the lake with sunset views. Excellent wifi, highspeed internet and TV. Our home sleeps 7 and has a full modern kitchen with all the supplies to cook a fabulous meal, 2 full Baths and 1 half bath. Washer and dryer for your convenience. It's cozy and comfortable with all the modern touches you would expect. Two bedrooms have a queen size bed and the master bedroom has a king. All with luxury bedding. Front porch for relaxing and back patio for grilling and entertaining or sitting around a fire with gorgeous lake views. Beautiful walks to Methodist Park and Elrod Ferry recreation are a short distance away. There is also access to the Elrod Ferry boat ramp 1 mile away for your boat and jet skies. Downtown Hartwell is 3 miles away. The property was very beautiful. Lots of room to play outside and areas to walk. We had a wonderful Thanksgiving dinner at the house and plenty of utensils to use. We would definitely stay again. Thank you for making this available. Very peaceful and fully equipped. Will rent again in the future. Only one recommendation. Room darkening curtains for bedrooms. The sun comes up on the side where the bedrooms are so at sunrise the bedrooms are fully lit. Overall one of the most relaxing weeks we have ever had. We rented a boat for a day which was a super simple process and enjoyed the lake. Serenity is a lovely, almost new residence, close to Hartwell. I would call it neorustic with a nice floor plan. Very quiet. It has great views of the lake, especially at sunset. (We all took pictures.) The boat dock we used was new and covered, but required a walk through woodland: and the master bedroom could be improved with room darkening shades. We have over decades stayed at many Hartwell Lake houses. Overall we were pleased with our stay at Serenity and pleased to give it a five star rating. Stayed at Serenity on Lake Hartwell during our daughter's State Golf Tournament. Great location to the course. We enjoyed our stay over the weekend. The house was very nice and I would recommend. Would be nice if it had a deep water dock just behind the house, other than that.....Loved it! Great house with all you need. Location is near the various state parks. View of lake and steps from the house. Would look to revisit the same property in the future. We enjoyed our stay at this very clean home. Comfortable king bed in the master. Kitchen had all you could need to prepare daily meals which was very handy. Nice view of the lake from the back patio and the dining table and living room. We came to fish and the lake is filled with bass and catfish which made it fun. The picture showing the path to the dock is actually a private, owners only dock. We were able to hike through the woods to another dock. The cable didn’t work but that wasn’t a huge deal as the cell service is great in that area. Thanks for your kind review. I’m sorry you had trouble with the tv cable. It actually does work but has to be on the correct channel with the correct remote. I’ll make sure there are proper instructions for our next guests.